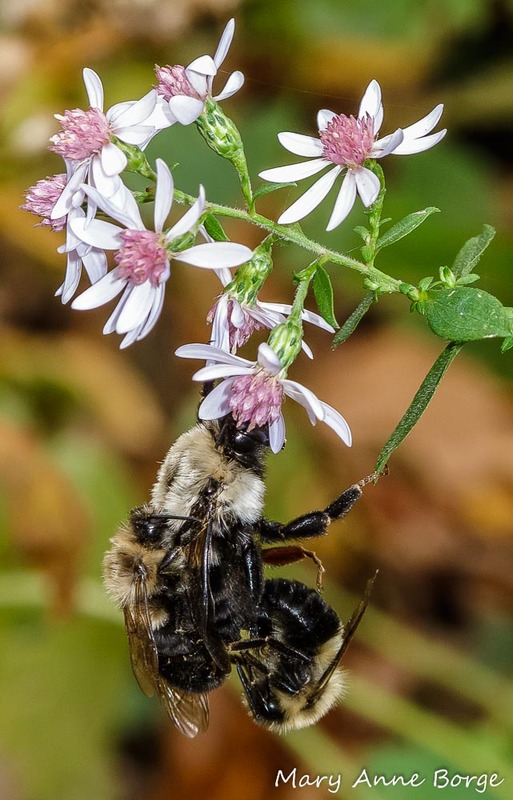 On a cool day in early November, my husband spotted a cluster of Bumble Bees on Blue Wood Aster (Symphyotrichum cordifolium) in the garden outside our living room window. A queen bee was at the center of the group. She was clinging to a flower, with as many as four other bees grasping her. Amazingly, the queen was supporting the weight of the entire group. We watched for about an hour. During that time the number of bees clutching the queen varied a bit as some of the bees came and went. It was a puzzle trying to figure out what was going on. Since the temperatures were fairly low, could they just be huddling together for warmth? Bumble Bees (probably Common Eastern Bumble Bees (Bombus impatiens), one mating with the queen. In the Bumble Bee world, the only females that mate are queens. The primary role of male Bumble Bees is to pass on their genes if chosen by a queen for a chance to mate. 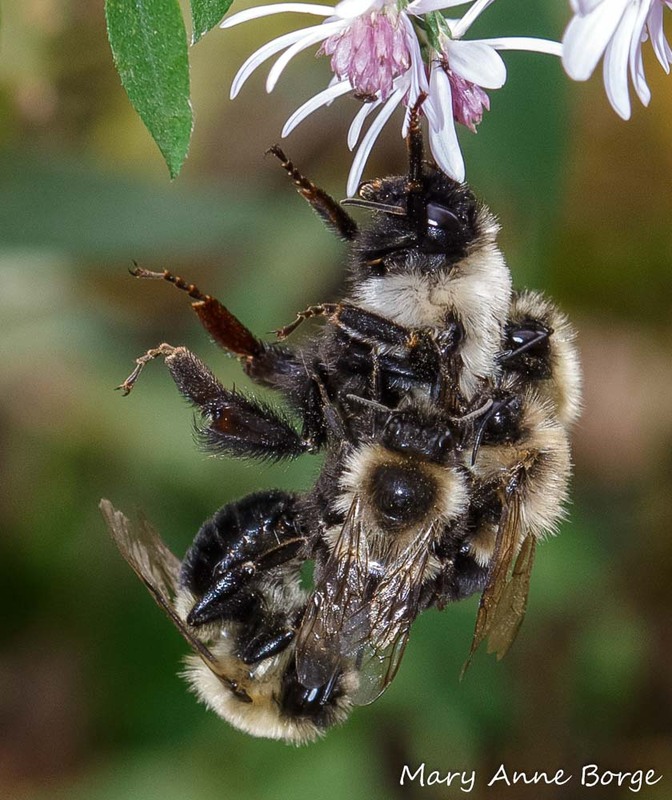 Queen Bumble Bees decide who their mating partners will be. When a queen is ready she’ll chose the lucky male that will be the recipient of this honor. This gathering may have been the male bees’ last chance to pass on their genes. The males, any non-breeding females and the old queen from a colony will die as the cold winter temperatures set in. 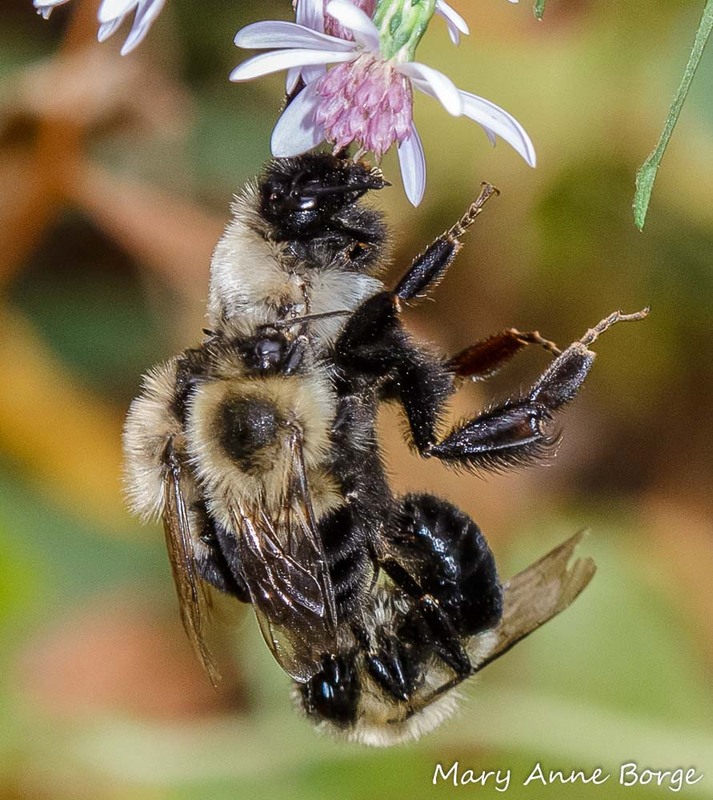 Only newly emerged queen Bumble Bees survive through the winter. Soon after successful mating, this new queen will seek an underground winter hibernation shelter. If she survives the stresses of winter, she will be among the first bees we see next spring, foraging on spring ephemerals. She’ll look for a nest site, provision it with nectar and pollen, and begin laying eggs for the new Bumble Bee generation. Queen Bumble Bee in spring on Virginia Bluebells (Mertensia virginica). Thanks to Dr. Randi Eickel of Toadshade Wildflower Farm for help identifying the bees and their behavior. Thanks to Jeff Worthington for ‘wanna-bees’. Goulson, Dave. A Sting in the Tale. 2015. Heinrich, Bernd. Bumblebee Economics. 2004. Colla, Sheila; Richardson, Leif; Williams, Paul. 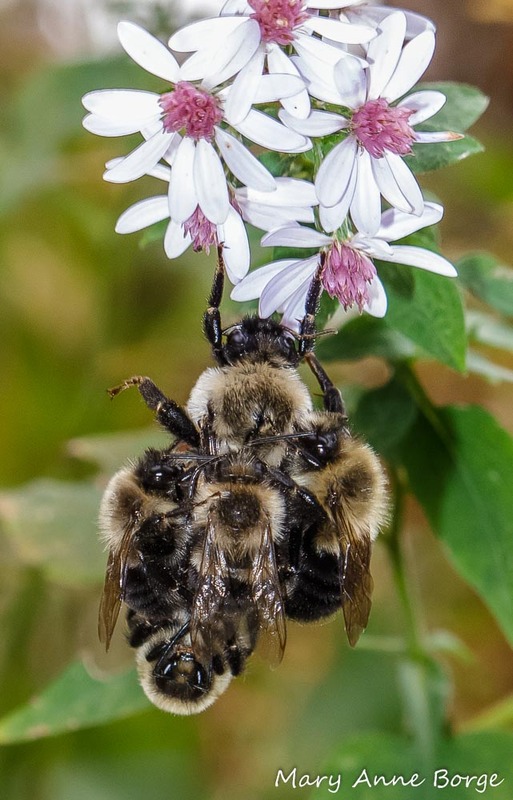 Bumble Bees of the Eastern United States. 2011. 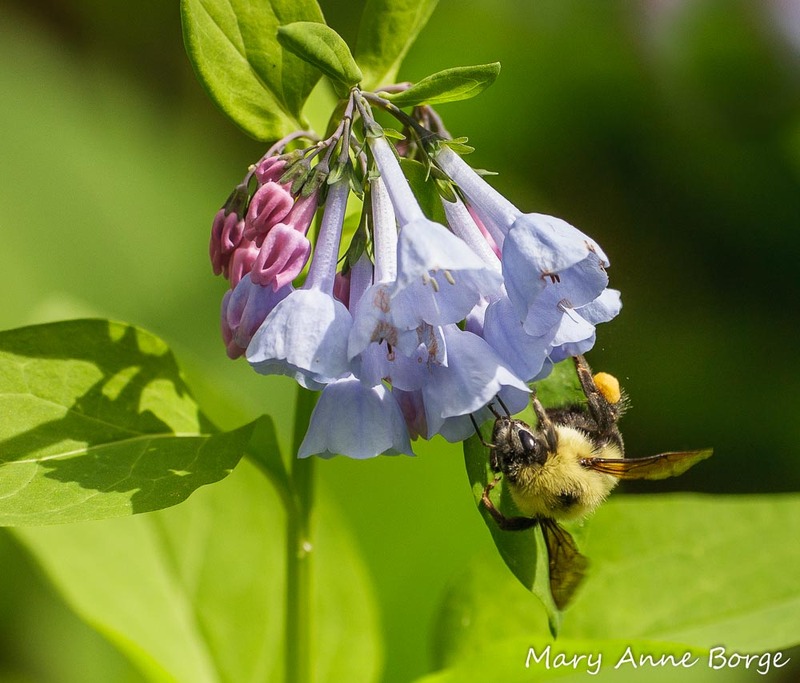 This entry was posted in Nature, Other Insects and Spiders and tagged Bombus impatiens, bumble bee, Bumble Bees mating, mating, nature by Mary Anne Borge. Bookmark the permalink. Fascinating observation & observations, Mary Anne! I love your postings, Mary Anne. I am so glad that I happened upon your blog. Each time one of your postings arrives in my inbox, it is like receiving a wonderful gift. Keep on inspiring others with the beauty and miracles of nature – something that I try to do in my corner of the world, too. Your macro photography is the best – always beautiful and educational. Thank you. I guess you never know what you might see in your own back yard!